Apart from the major cryptocurrencies in the crypto markets, there are also other newer “third generation” coins which investors have started noticing and TRON (TRX) Coin is one of those “third generation” crypto coins which have started disrupting the markets. Since the establishment of the TRX coin, it has shown positive performance against the dollar and also against other crypto currencies. But why anticipate that the TRON (TRX) Coin will gain value? In financial markets, it is all about anticipating the next move that an asset will make. However, as easy as it may sound, it requires substantial analysis and research into what is happening and what is likely to cause the asset’s value to either depreciate or rise. For the TRX Coin, from a closer look at how the digital coin has been performing on the charts, there is a clear indication that the coin is headed for a great future. In a span of less than a month from December, 2017, the value of a single TRX Coin has moved from below $0.05 to $0.1133 as of 11th January 2018. 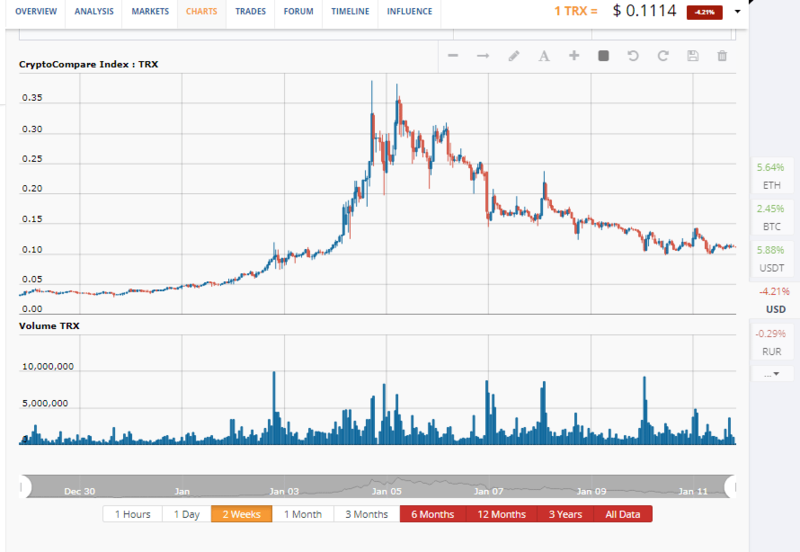 Despite the slight retracement on 6th and 7th January, the coin has generally assumed a bullish trend. Also, with the skyrocketing prices of Bitcoin, investors are now applying a cautious approach with Bitcoin since they expect it to at least pull back from its continued uptrend that has been continuing for a long period now. Therefore, they are looking into other promising crypto currency coins where they can invest in. this is where TRX Coin comes in. Of course there has to be something behind the performance of the TRX Coin. To start with, TRX operates on TRON, which is a Chinese block-chain built on open-source platform. Amazingly, this protocol allows users to liberally publish, store, own data and subsequently decide at what cost to share it. This helps to eliminate brokers and gives the miners the ability to directly contact their customers. In addition, TRON (TRX) enjoys an unwavering support from top Chinese developers as well as notable members of the Chinese business community which gives it the ability to expand and develop. The technology has excellent applications, and the currency appreciating is inevitable. That is just mathematics. But at this point, with so many eyes on Tronix, to plagiarise the whitepaper? How stupid is this? So much work and money goes into this project and then to screw things up with something that should have been so routine and anodyne. Very disappointing from the leadership. That is a false claim. 100% FUD spread by those who have much to lose from Tronix going fully live eventually. TRONIX foundation has been peer reviewed and scrutinized for over a year by the top software development firms in China, and their whitepaper was cobbled together earlier last year in China when the team was small and had little financial backing, and used sections of existing whitepapers (filecoin etc) in a temporary effort to file the company token TRX for market in China. The whole thing has been lost in translation, and they should have had that original white paper updated with a qualified translator and review team. A costly mistake, but not one of malice or ill intent. Justin Sun responds immediately to this controversy and opens the project up for further and continuous review going forward.